Whether a novice or an experienced gardener with a lot of land, plants such as mint need to be kept in check. That’s why container gardening is great! They are easy to start, maintain and are wonderful for those with little time or space. There is little to no weeding, no tilling, and allows plants that aren’t winter hardy to be grown. Any container will serve well in a garden, but be mindful of size ratio in comparison to how large the plant will grow. Growth can be stunted or need water more frequently in a container that is too small. Putting a layer of rocks in the bottom also helps to keep the pot upright as the wind may blow over a top heavy plant. Searching for broken plants and pots three stories below may not smiled upon by a neighbor’s dog. Raised beds have recently gained a lot of popularity due to a book called All New Square Foot Gardening by Mel Bartholomew. In the garden center, I regularly get customers inquiring or raving about this technique. While raised beds are nothing new, they do offer a unique, space-saving garden. To simplify, it involves a raised wooden bed filled with an extraordinarily nutrient rich soil and compost mixture. These beds can be modified and customized to suit the gardener’s needs. They utilize all available space, allowing the gardener to grow a lot in a small area. When faced with a small amount of space for a large, trailing plant then the best way to grow is up. While falling into this category, tomatoes are typically grown on a trellis; however there are other plants that also grow well this way. Cucumbers are an excellent choice for this as they readily take to trellising. 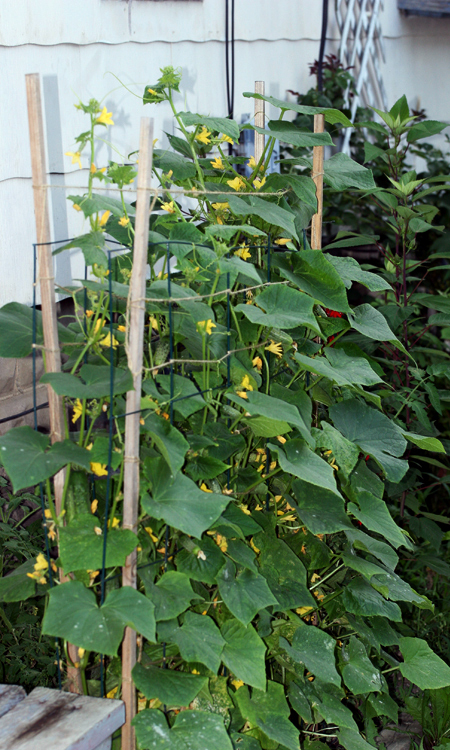 Peas, squash, beans, and melons can also be effectively trellised. Be aware that any plant with a large fruit will not grow as large due to the extra weight that must be supported. Once big enough, be sure to train any trellised plant to climb onto the trellis. See how stunted the sage is? Layering can save a great deal of space. Placing tall plants behind short plants is one version of this, but a more effective version is raised containers behind shorter containers. This way plants of the same height can all get the right amount of sun. 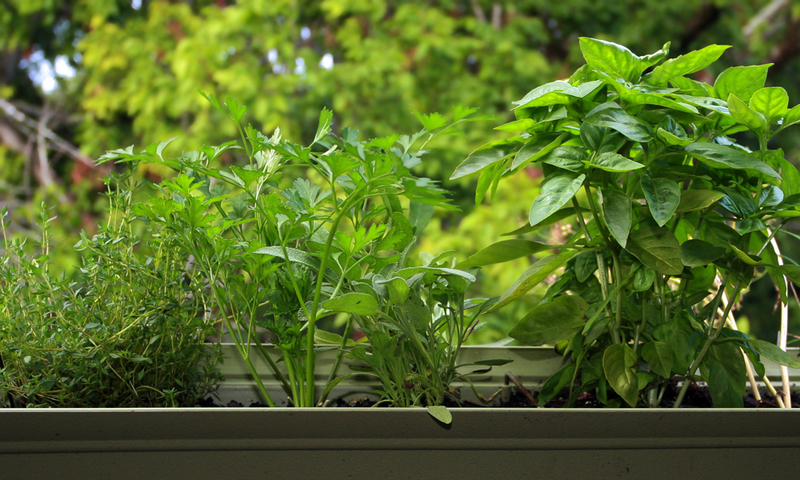 For example, last year I grew some herbs in a long planter, but the basil quickly grew so tall that the sage’s growth was stunted due to sunlight being blocked out. If these were layered, the sage would have still been able to get enough sun to grow well. 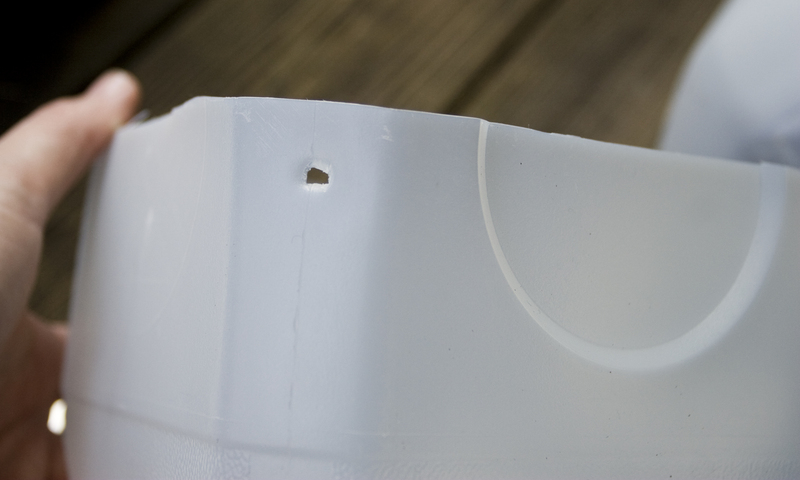 Holes can be drilled in any container to create a successful addition to any garden. Food grade plastic buckets: 5 gallon frosting buckets from a bakery. Look for patio versions of plants as these are selected for their exceptional growth in limited space or try a dwarf fruit tree. Get ready to experiment with a variety of containers and plants. Container gardening offers something for every gardener: the decorative, creative, thrifty, or trendy. Bees are buzzing, frogs are chirping, and flowers are blooming. Spring is right around the corner and we’re all thinking about starting our gardens. Before buying every packet of seeds and every other sprouting product—stop! There is a lot of planning to lure a garden up out of the ground. I prefer cost-saving measures while making the most of my space. Because I live in an apartment, I am limited in space and have improvised by container gardening. There are many options for container gardening such as raised beds, pots, and any other home-rigged container. Also, soil and seed markers are needed. Working in a garden center, I see various techniques and costs of startup. Since my goal is to maximize quantity while minimizing cost, I try to grow from seeds, rooted cuttings, or plant division. There are some plants—such as mint and tarragon—that should only be propagated by cuttings or division since they either do not breed true from seed or are sterile. I don’t find seeds to be particularly picky about what they’re sprouted in, so any well-draining container should work. 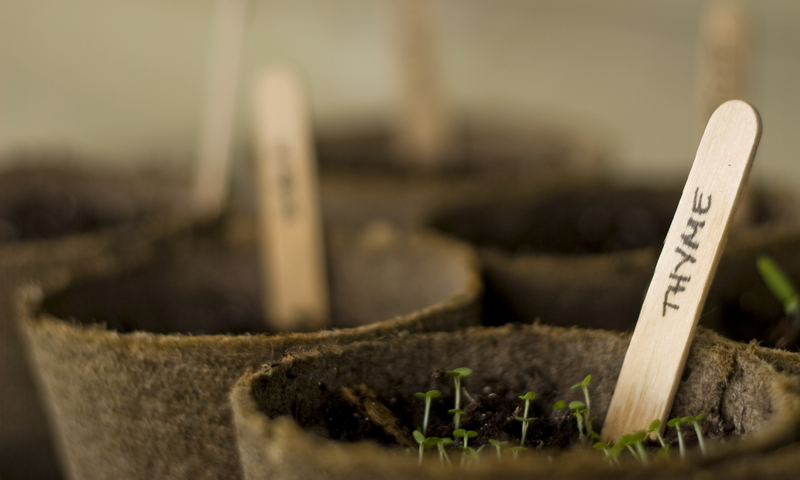 The easiest way to do this is to use small peat pots, recycled nursery pots, or a seed starting tray; however, there are many other thrifty options ranging from paper or plastic cups, cardboard egg cartons, and opaque milk jugs. Avid gardener Paula Nowak also suggests strawberry containers, clear take out containers, 2 liter bottles, or any other clear container; however, she prefers milk jugs for their reusability and size. 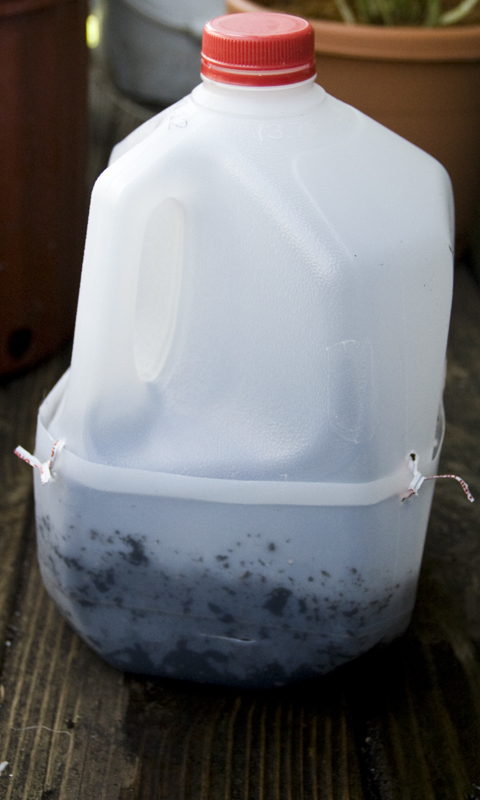 Making a milk jug into a miniature greenhouse is simple. 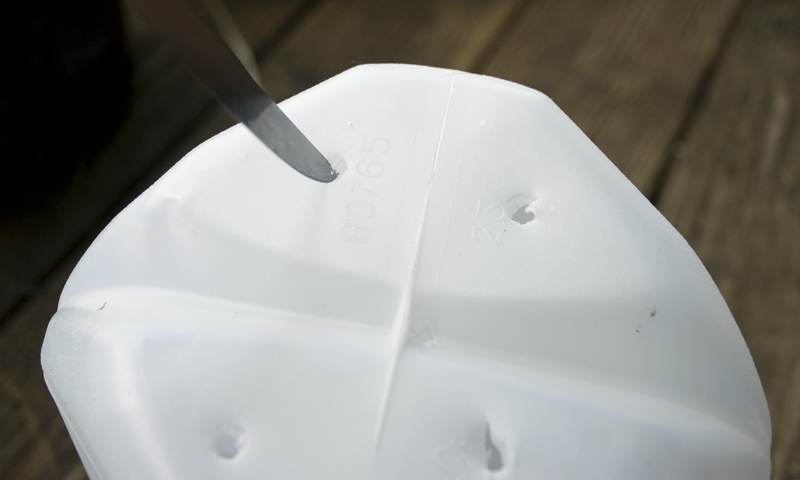 According to Nowak, start by making drainage holes on the bottom—a simple knife will do the job. On the bottom of each side, she also makes a small slash to aid drainage. She then makes a small, horizontal cut halfway up the side of the jug. 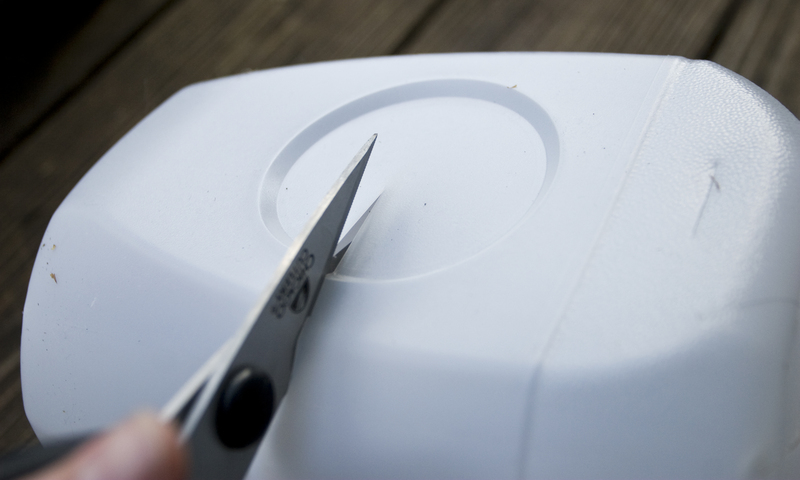 Using scissors, she cuts around the entire jug to separate the top from bottom. Then, she punches a hole in each corner of both pieces. Water well and let drain before planting seeds. Then Nowak connects the top and bottom pieces together with green floral wire. Remember to remove the lid from the jug. Now it’s time to stick the jug outside to be forgotten until spring, or if already spring, check regularly for dry soil or sprouts. I find it easiest to lightly fill the container with soil and gently pat it down. This will leave just enough space for your seeds and a blanket of soil to cover them with. 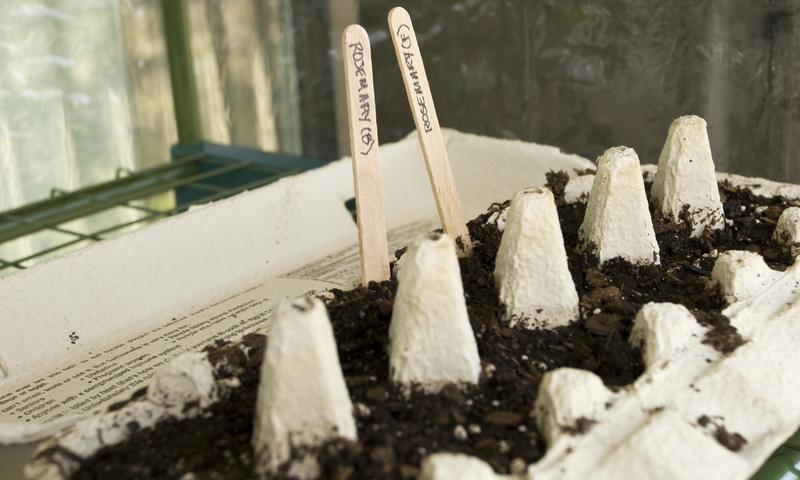 Place your seeds on top of the soil and tuck them in under a thin layer of soil. This will work for most seeds; however, there are some seeds—such as hibiscus—that need specific treatment before planted. These preparations can range from soaking in water, chipping a strong husk, or specific temperatures to increase the chance of germination. It is best to double check their needs to ensure seeds sprout. 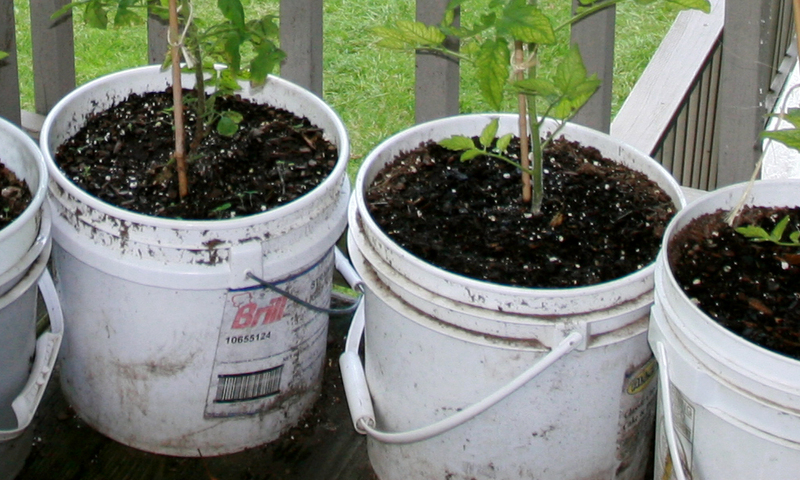 These thrifty, time saving, and space efficient methods work in every situation whether you container garden or a traditional garden. Now it’s time to tuck in your seeds, kiss them good night, and say “Good Morning!” when they wake up in spring.